Last year, AKC approved the addition of amateur stakes at cocker field trials. An initiative led by members of the English Cocker Spaniel Club of America (ECSCA) field events committee and supported by the American Spaniel Club (ASC) Field Committee, it took about eight years to put into place. "The ECSCA Field Events Committee was asked by several clubs about having points for amateur stakes," said Sue Sellers Rose, AKC breed and hunt test judge, who co-chairs the committee. "This was the second time this has been brought up. Each time it has come up, we have sent out a questionnaire to our field interest members asking if they would support amateur stakes at our field trials," she said. "This time they were in favor of having pointed amateur stakes." Field trials are competitive events where dogs are judged against each other at multiple events and earn points towards a champion title. They are different from hunt tests where dogs are judged against a scorecard and earn hunt test titles. Until this year, cocker spaniels and English cocker spaniels all competed in open events, pros and amateurs together, but with the new amateur stakes, supporters anticipate more beginner interest attracting more people to the sport. "A professional shall be defined as any person who accepts, or has accepted, money, or other compensation (defined as anything that has a monetary value), for the field training or field trail handling of any breed of hunting dog." "Once a person performs as a professional for a one year period, they cannot run in an amateur stakes thereafter. If they have not run as a professional for a full year, and they want to reclaim their amateur status under these directives for the purpose of any particular field trial shall be made by the Field Trial Committee for that trial." Proponents for the amateur stakes felt they should increase participation in cocker field trials. Others felt it could fragment the entries, drain human and financial resources, and hinder development. Bethann Roettger, a professional trainer in Minnesota, AKC field event judge, and co-chair of the ECSCA Field Events Committee explained what the committee is trying to accomplish. She said, "Our goal is to provide the competitive opportunity for amateur handlers without the pressure of competing against professionals handlers." Cockers and English cocker spaniels are the only breeds allowed to compete in the same field trial event. All others are limited to one breed. Cockers compete to win, or to place and earn points from the open all-age stakes, or amateur open-all age stakes that fulfill the requirements for a field championship or amateur field championship title. The amateur stakes are held in addition to the others at a cocker field trial. In time, it is hoped there will be enough interest and participation to hold both a National Cocker Open Championship and a National Cocker Amateur Championship. "We expect that six to eight amateur stakes will be offered each year to start, and hope to build to ten each year over the next five years," Bethann added. "It takes an entry of at least ten cockers (cocker spaniels and/or English cocker spaniels) to meet the minimum for awarding points," Bethann explained, "and 30 cockers must qualify to hold an amateur national championship event. As is in the open stakes, a dog needs to have earned one point in the three years previous, including the year of the championship to be eligible to compete in the national event." The regular official stakes at a spaniel field trial are puppy, novice, limit, open all-age, qualified open all-age, and amateur all-age. Points are earned from the open all-age stakes or qualified open all-age stakes. Judges may give award of merits that are noted in the judge’s book, but no points are awarded. Double points shall be awarded for 2nd, 3rd, and 4th placements in the National Championship Stake." 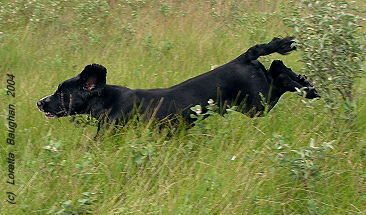 In a regular field trial, the dogs are run on land three times. Dogs in open or amateur all-age stakes run on land in pairs called "braces". The dogs’ handlers are in two separate adjacent fields with three gunners and two judges. Each judge is assigned one dog of the pair per series (land test). Judges rotate dogs with each series (run). 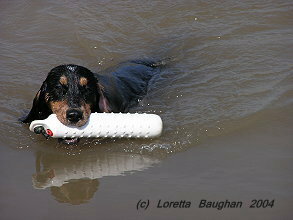 To earn a field or amateur field championship, it has to retrieve game from water after a swim. The water test consists of two, back-to-back, open water, 30-40 yard retrieves of dead ducks or pheasants. The dog is backed up from shore 10 to 15 yards. The water test can be a separate event or held with an AKC licensed field trial. Once a dog is certified by the judges for passing a water test, it is eligible for field and amateur championship titles. It only needs to be certified once. At championship trials, dogs run five times on land and may include a water retrieve. Events can take two to four days to complete, depending on the number of dogs entered. Some springer trials routinely number more than 60 dogs and national events are topping 150 dogs and take almost a week to complete. Cocker field trials average an entry of 30 to 45 cockers. national championship trials can attract 65 cockers or more. The first dual CH cocker (cocker spaniel or English cocker spaniel) was Dual CH My Own High Time, bred by Herman Mellenthin. A field champion may be designated as a dual champion if it is recorded as a show champion. And if a dog earns a champion of record, obedience trial champion and field champion, the dog is designated as a "Triple Champion". The most recent cocker field champion is FCH Madison’s Pride and Passion, SH, Pride, bred, trained and handled by Trish Jackson. Trish also owned and handled the first cocker to earn a master hunter title with CH Pett’s Southwest Breeze, CD, WDX, MH, Ruby, in the mid 90’s. "Our goal is to provide the competitive opportunity for amateur handlers without the pressure of competing against professionals handlers." In addition to the three spaniel parent clubs; American Spaniel Club (ASC), English Cocker Spaniel Club of America (ECSCA) and the English Springer Spaniel Field Trial Association (ESSFTA) there are about 29 hunting spaniel or sporting spaniel clubs in the United States authorized to hold field trials for cockers. The first US cocker field trial since the1962 one hosted by ASC, was held in 1974 and hosted by the ECSCA. Seven dogs ran in puppy, novice, and open all-age stakes. None were trained though. (Jubilee, 428.) A lack of gundog trainers and training resources required cocker clubs to tap the expertise of the long standing springer clubs and with their help, put an entry level program into place, the working dog tests. The WD and working dog excellent tests offered cocker people opportunities to develop training resources and skills to be competitive in field trials. Still field trials failed to attract a significant following. In the mid-80’s AKC developed its hunt test program that encouraged greater participation in field events judged on the skills of the individual dog and handler. The national cocker championship field trial has been hosted by the ECSCA since the late 90’s. 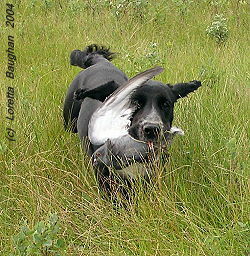 The addition of the cocker amateur stakes reflects a growing interest in hunting cockers and the sport of field trailing.. The 2006 Cocker National Open Championship will be held in Michigan on October 26th through the 29th and will be judged by Mrs. Janet Christensen, WA, and Paul McGagh, ND. More information will be on the American Spaniel Club website as it becomes available at www.asc-cockerspaniel.org. Bobbie Kolehouse lives in central Wisconsin and raises cocker spaniels under the Kindred prefix. Interested in animals throughout her life, like many people, she had a pet cocker as a child and many years later, in 1986, became involved with the breed, again. She's served on several boards, as an officer and on committees in a range of capacities, for an assortment of animals - domestic and wild - as well as cocker spaniels. Currently, she serves on the American Spaniel Club History Committee, Anniversary Book Committee, the American Spaniel Club Foundation Scientific Research Committee and is Mid West Chair for the Field Committee. A member of the International Association of Canine Professionals and Dog Writers Association of America. For the past five years, Bobbie's column called Field Notes has appeared in the Cocker Spaniel Leader - additionally, her articles have appeared in the AKC Gazette, Gundog, Dog News and others.